"Mankind's fascination with the moon encompasses thousands of years . . . from the dawn of civilization to the exploration of the lunar surface. Intrigued by a passage in Shakespeare's 'A Midsummer Night's Dream,' I set out to capture the mythological essence of man's relationship with the moon. In my quest, I traveled back in time and across continents. 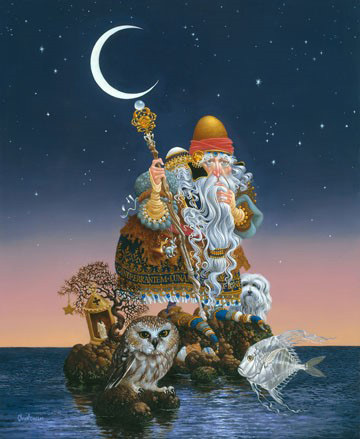 'The Man Who Minds the Moon' incorporates symbolism from Astrology, Ancient Babylonia, the Orient, Greece, the natural world, Shakespeare and Medieval Europe. "Although in some traditions the moon has a feminine aspect, I have chosen those characteristics that related to the 'man in the moon.' 'The Man Who Minds the Moon' is the caretaker or guardian, much like an aged Victorian gardener who aimlessly shuffles around the flower beds, yet whose garden is always immaculately kept." There are sixteen moon-related symbols in "The Man Who Minds the Moon." Can you find them?